The new deal will make Clayton Kershaw the highest-paid pitcher in the game. • The money: Of course it’s crazy. Kershaw’s average salary of $30.7 million will be the highest ever for a major leaguer, eclipsing the $30 million that CC Sabathia received on a one-year deal from the Yankees in 2011. In fact, the Kershaw deal is far greater than the seven-year extensions signed by Justin Verlander ($180 million) and Felix Hernandez ($175 million). One difference: Both of those pitchers were two years away from free agency when they signed their new deals, while Kershaw was one. Truth be told, Kershaw should be far above Verlander and Hernandez, crazy as that might sound. Kershaw’s career ERA-plus – that is, his ERA adjusted to his ballpark and league – is 146. Both Verlander and Hernandez are 127. The average is set to 100. Kershaw is the best pitcher in the game, and not by a little. The Dodgers are the biggest-spending team in the game, and not by a little. Sabermetricans such as Fangraphs’ Dave Cameron peg Kershaw’s actual value at about – you guessed it – $30 million-plus per season. What changed from last summer, when I reported that the Dodgers and Kershaw got close on a seven-year deal in the $210 million range? For one thing, the money – the original offer, according to a source, actually was closer to $200 million. Other factors as well may have led to the breakdown in the earlier talks. In the end, though, cooler heads prevailed, and the two sides reached agreement before exchanging figures for Kershaw’s final year of arbitration. • The opt-out: This is the clause that makes a great deal for Kershaw even greater. The pitcher can void his contract after five years, and become a free agent at – gasp – age 30. Remember: Opt-out clauses hardly ever work in a club’s favor. If Kershaw pitches well and is healthy after five years, he will opt out. If he is injured or in sharp decline, he will complete his contract and still get his $30.7 million per season. The Dodgers telegraphed Kershaw’s opt-out by giving one to free-agent right-hander Zack Greinke last offseason; Greinke can void his six-year, $147 million deal after three years. Both Kershaw and Greinke are represented by Casey Close. So, ahem, is Japanese right-hander Masahiro Tanaka. How do you say opt-out in Japanese? I don’t know, but rest assured that someone in Close’s agency, Excel Sports, will explain it to Tanaka. • The Dodgers’ payroll: Hoo boy. The Dodgers likely will zoom past $250 million if they sign Tanaka. 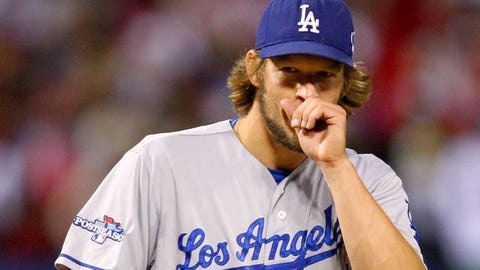 Kershaw will be their fifth $20 million a year player, joining Greinke, Adrian Gonzalez, Matt Kemp and Carl Crawford. Tanaka would make six. Hanley Ramirez could make seven, if the Dodgers sign him to an extension. But who’s counting? The Dodgers treat the luxury-tax threshold the way teenage drivers treat yellow caution lights – they barely note the warning, then floor it. Their tax penalty was $11.4 million on a $243 million payroll in 2013, and at least figures to be in the same range in ’14. The threshold is rising from $178 million to $189 million, but the Dodgers’ payroll likely will rise in kind. And, as a second-time offender, the Dodgers will be taxed at a rate of 30 percent, as opposed to 17.5 percent last season. Club officials keep talking about “Phase Two,” when the team will rely more on young, homegrown talent and less on big-ticket items. Maybe the Dodgers will draw the line at Tanaka, but I will believe it when I see it. They just keep hitting the gas.